Upon first glance, the Rift Zone looks like a very clean bike. Its lines are straight, the colors are sharp and the design conceals the bigger 29-inch wheels well. But upon a closer glance, it seams to be missing an important pivot. The rear one, to be exact. The 110-millimeter travel bike utilizes the flex of the carbon – engineered to only move a maximum of 20 millimeters – to eliminate the need for a rear pivot. Designing a bike without a rear pivot keeps the price down, as well as the weight. 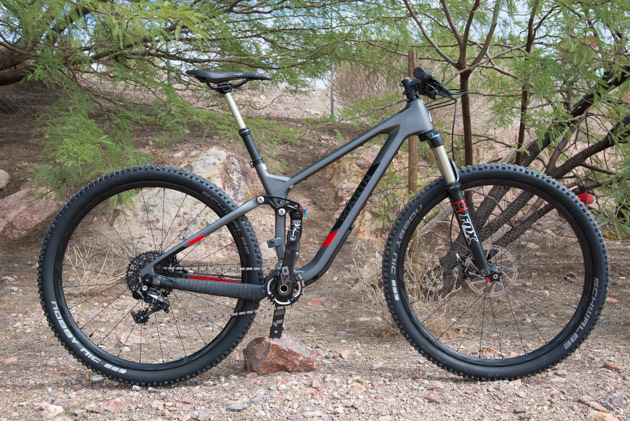 The 29er trail bike comes in 5 models–2 carbon and 3 alloy–ranging in price from $2,200 to $6,600. 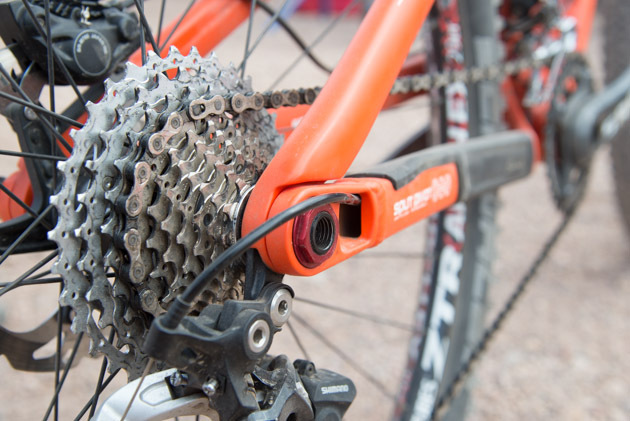 Pictured is the Marin Rift Zone 9, which sports a SRAM XO build. The rear triangle has been designed so that the flex happens in the desired area, the middle of the seatstay. 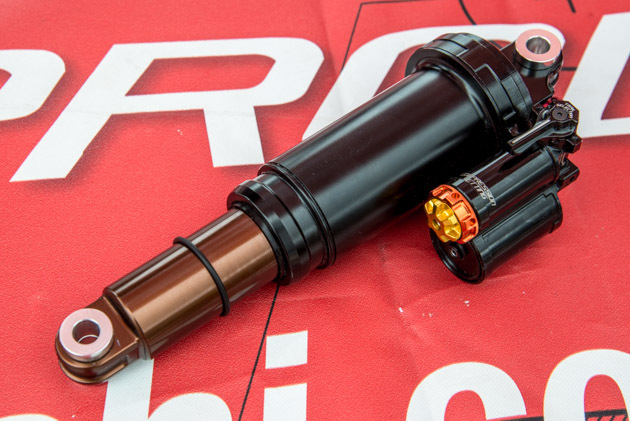 The top-tier shocks from Marzocchi have received a new facelift with the extra-hard ‘Espresso’ coating, including the all-new 053 shock. At 300 grams, it might possibly be the lightest piggyback shock on the market. And it only costs $339. The new Marzocchi 053 shock tips the scales at just 300 grams. It sports the extra­-hard 'Espresso' coating on the main tube and has three ride settings: Up, Ride and Downhill (URD). 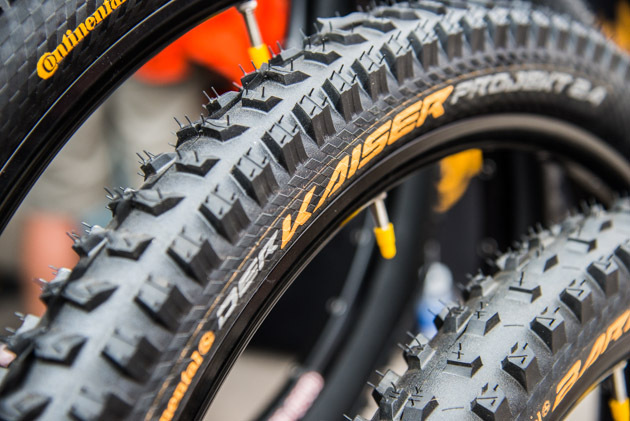 Continental Tires has added two new downhill-oriented tires to their lineup: the Kaiser and the Baron. Weighing only 950 grams, both tires are intended for the downhill racer and only come in a 2.4-inch width. They will be available in 26-, 27.5- and 29-inch sizes. The Kaiser may only come in a 2.4-inch width, but at 950 grams, it’s definitely a solid choice for enduro. 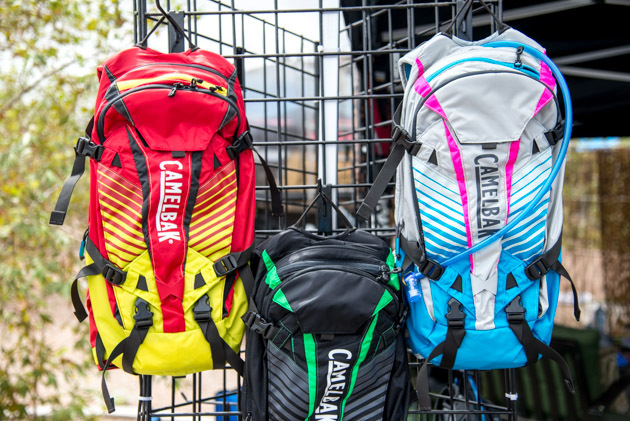 And speaking of enduro, Camelbak is launching the Kudu, which is an enduro-oriented pack. It comes in two sizes, the 12 and 18, and sports several stage-racing features, including sleeves that can carry a half-shell or full-face helmet. Price: $200. Camelbak is bringing back some of their original colors (upper right), but for those of you that are a little wary, don’t worry, the Kudu available in five different color schemes. 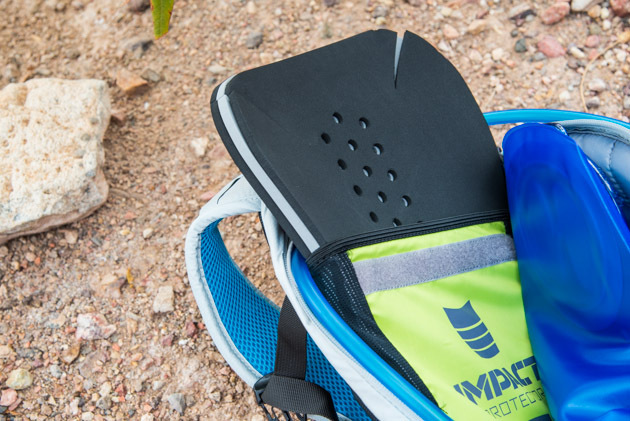 The Kudu includes an impact protector for the back (which is becoming mandatory in some enduro races), a tool pouch and an integrated rain fly. 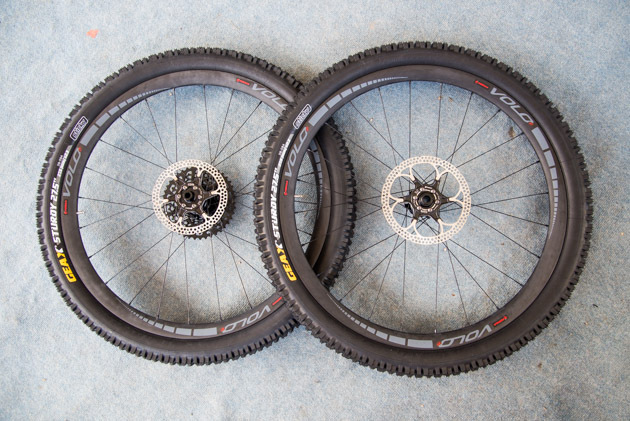 New for 2015, the Formula Volo AM Hyperlight 27.5­-inch wheels are aimed at the all­-mountain/enduro rider. They feature 24­-millimeter-­wide clincher rims and Formula's own AM hubs. Weight: 1,574 grams per pair. Unfortunately, the tires don’t come with them. 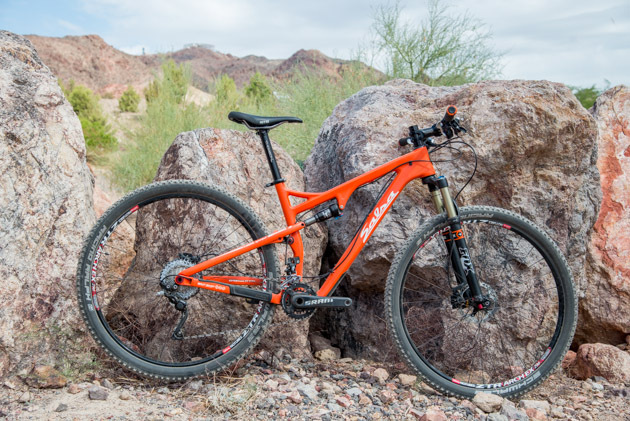 A year after adopting the Split Pivot suspension linkage, the Salsa Cycles Spearfish is now available in two carbon models: the Carbon 1 (pictured here) and the higher-­priced Carbon RS­-1. It is also available in two alloy models: the Spearfish 2 and Spearfish 3, priced $3,400 and $2,800, respectively. 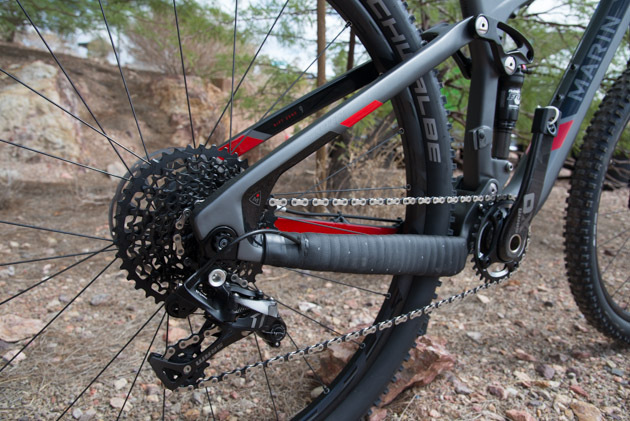 The Carbon 1 comes with a Shimano XT drivetrain and costs $4,900 complete. The Split Pivot system, designed by Dave Weagle, incorporates the rear pivot into the rear axle, which is engineered to separate acceleration forces from braking forces, while at the same time reducing weight.